Is the one slightly blue or is it just the lighting? 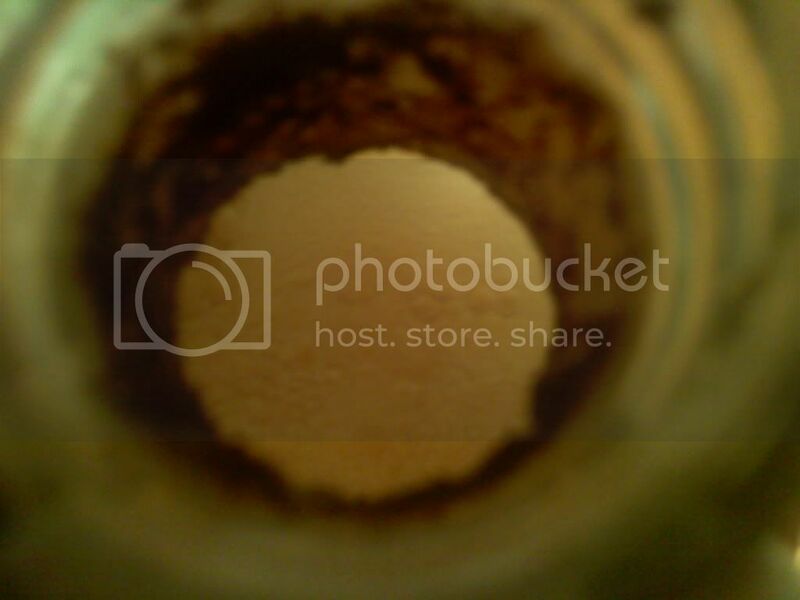 Gotta love a nice pellicle, not just anyone would drink something that looked like that. Since the addition of raspberries it has turned pink. @ Tom, not sure on the color. They are in a friend's basement. That beer has literally been in the barrel for barely over a month. @ Tim, that thing is funky! I just pulled the stopper out of a little 1 gal saison I have going with some fantome dregs. I would swear the stuff on top had fur poking out! I have 3 wilds going in my closet. Only 1 has a thin layer of "dust" on the top. It does look like it's quite ropy though. Black77, That Brett IPA photo is sweet! I have seen some pellicles which have a blue tint to them. 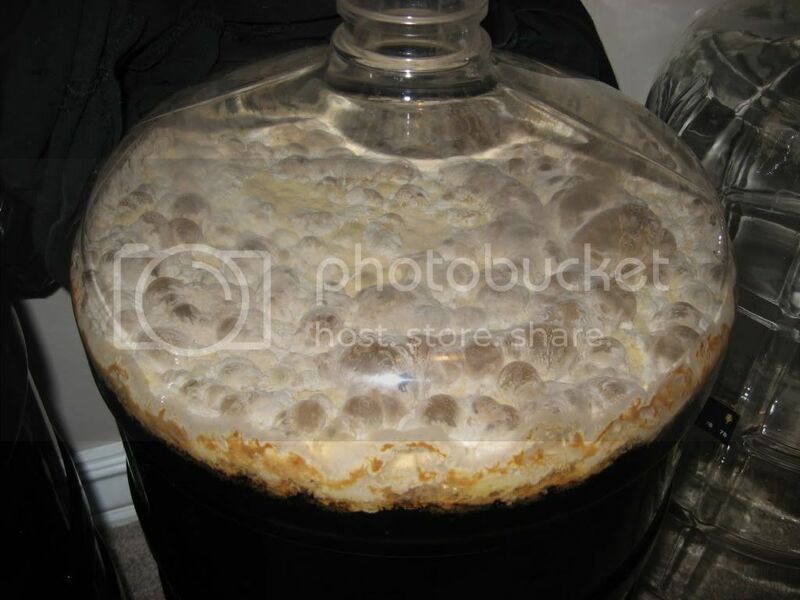 I remember seeing some photos from Ithaca when they were aging Brute in SS, and the pellicle then had a blue tint. Cool, now that I know someone actually reads my blog I should update it soon. I have a bunch of tastings to do, including the just bottled rhubarb sour. I was trying to post this the other day and photobucket was screwing with me, and then I forgot. Anyways, looks way different with some effort to light it up a little bit. 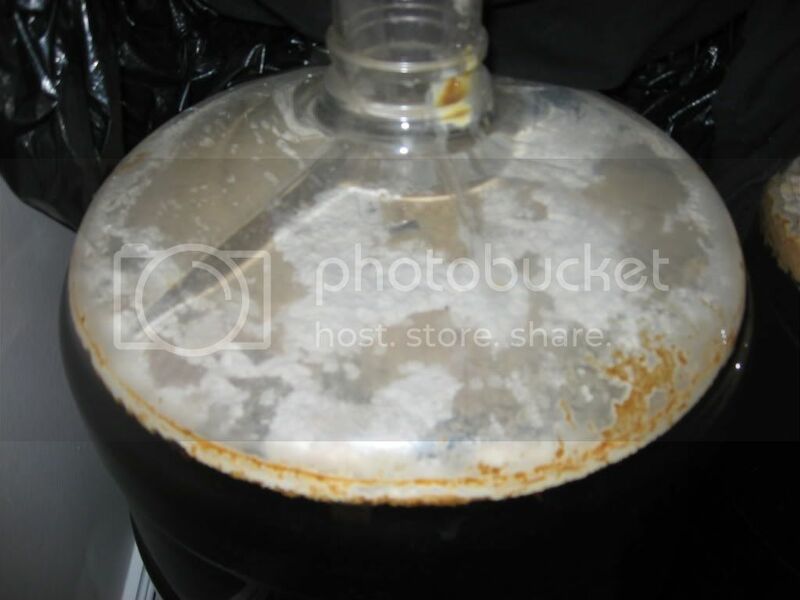 First I have a question about racking a beer with a pellicle. I have read that you should wait for the pellicle to drop before kegging/bottling, but I have a couple of beers that have had pellicles for about a year. They taste ready so what should I do? smellysell and JeffB, those photos are awesome, really add to the justification of the use of the word funk! I would disregard the pellicle in a any decision of racking. Only rack if your ready to keg/bottle. If the pellicle falls out it has nothing to do with the beer being ready. Its ready when you say its ready. How does it taste? Ready? Pellicles drop out from outside vibration, otherwise they are meant to always be there by nature. 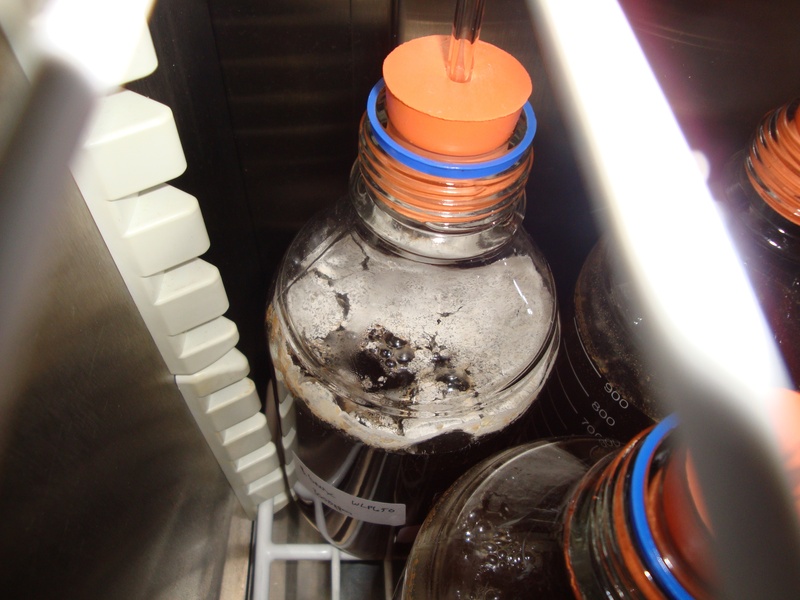 Break the pellicle when you pull samples.. it will just reform it is in no way and indication of quality or readyness. ChadY-That is what I thought and a few taste great right now. Others need a little more time. Thanks. I have another thread on here asking questions about my brett saison. I was out of town last weekend, came home and was going to check the gravity to bottle and bam, there was a pellicle. Guess i'll wait a little while now. Couldn't really get a good up close photo due to the condensation in my carboy. How strong is that saison? Which brett are you aging with? These are most of my current efforts. Nice photos Tom! Love how you got those cherries right up to the neck of the carboy. CLASSIC! Just drank a Cantillon Kriek from 2007 last night and man was it ever mouth puckering sour! Took me 3 hrs to drink the bottle (and then pitched the dregs into my 15 mos old flanders red of course). That kriek has been a pain to deal with. 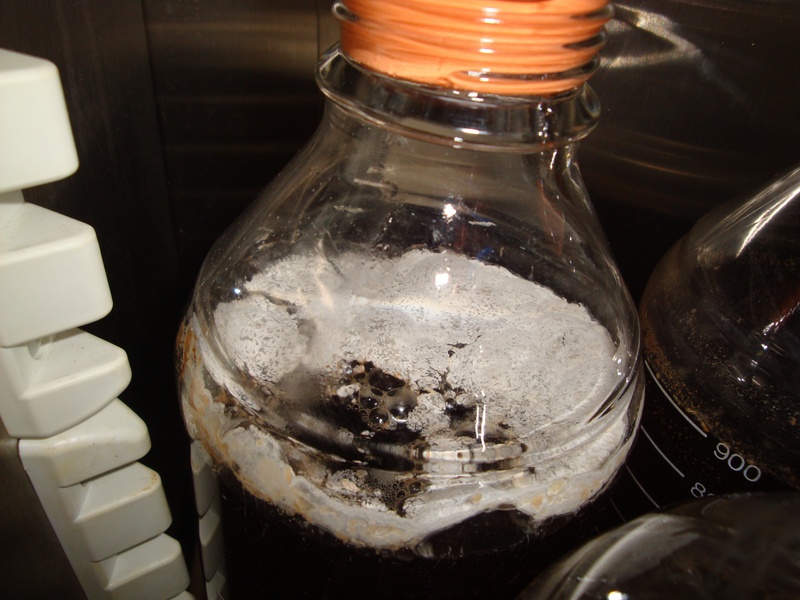 I added the cherries and when fermentation took off again they bouyed up and foam came out the airlock. I took some of the lambic out and it settled down after a few weeks so I added it back and the darned stuff foamed again. I was hoping the cherries would have sunk by now. I'll probably rack off them one day soon. The sour cherries were off my own tree, a North Star. The big honkin' cherries are storebought Bings. Thats 3lb of sour and 4 lb of sweet (all with pits), I froze them prior to addition to help break down the meat for better extraction. I was thinking they'd have busted up better by now but oh well. I've had a few bottles of the Cantillon in the last few months, they are certainly sour. My first kriek is just about that sour at 2 yrs old. I love the stuff although there are times when I'll blend with a little of something else to bring the sour down just a notch. Not the Cantillon, just my brew. The De Ranke is a great kriek, I haven't tried the Liefmans yet. Pics837 - Wyeast Roeselare and White Labs Brett C. This is a 50/50 blend of 2 batches of Flanders Red originally brewed Jun 08 and May 09 (pic taken Aug 10). Pics836 - Wyeast Roeselare, White Labs Brett C, and dregs from Lindemans Cuvee Rene, Petrus Aged Pale and Cantillon Lou Pepe Kriek 2008. This Flanders Red was brewed Jan 10 (pic taken Aug 10). That second one has a pellicle you could cut up and fry like a mushroom. Very nice. I suppose you drank some of the June 08 brew? How was it? I haven't used the Roeselare blend, I know its the Rodenbach mix but I've heard mixed reviews of it. The Wyeast lambic blend is really nice. Tom - Yeah, the pellicle on the new beer is insane, can't say I've seen anything like it. The blended beer won silver in the second round at the NHC. It is nice, but not sour enough for me. I'm blending both carboys in November, bottling half, and leaving the other half to age. Then brew another 5 gallons. Sounds like a good plan. I think blending is the way to go, I'm going to try a solera type thing with my 11gal barrel. Came home last night and my stir plate starter of Boon kriek had a big bubble in the vortex, and the definite beginnings of a pellicle. Even with the stirring. Thats crazy! I turned the stirrer off ust in case I was promoting acetobacter over the rest of the beasties. 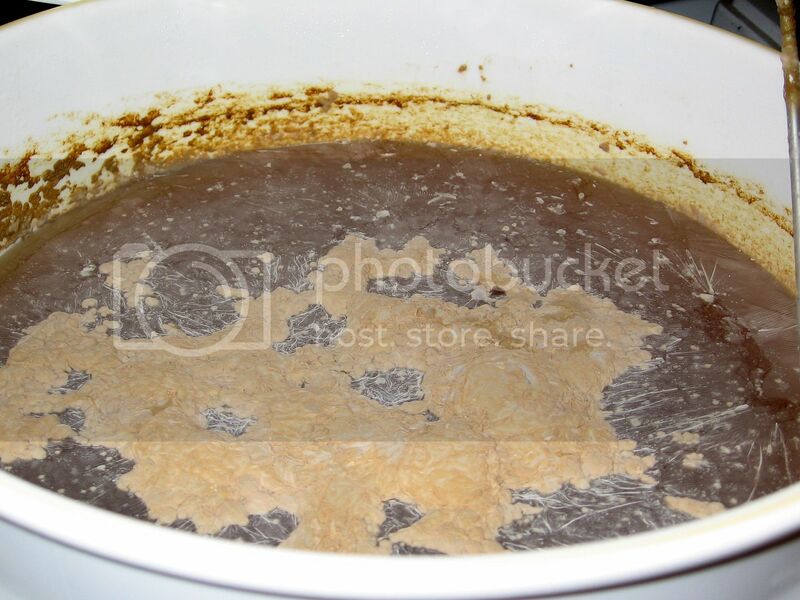 I think I'll brew up a small batch of lambic wort today and go ahead and pitch this starter. I just hope I'm not sick of lambics in a year because I'm going to have something like 20gal ready to go then. Some how I don't feel like that will be a problem Tom! New to sours and the BBB. Here are two sours I have going. Hey Philly! Nice to see you here...Yeah it looks like the Boon Gueze dregs are starting to work already with a wispy pellicle forming. Cool! Brewed a Saison recently using a mixture of WLP565 and Avery 15 dregs. Unfortunately (or fortunately) I don't believe I've got a handle on my Brett C infection that seems to show up from time to time. The yeast head is slowing dropping out. It showed up about 10 days ago after WLP565 pooped out at 68% apparent attenuation. I pitched the dregs of Lindemans gueuze to the second carboy and moved it. It disturbed it and the pellicle got compromised a bit, but I added more bugs so I'm not worried!